Come fish Ely Minnesota, the Boundary Waters and Quetico and experience some of the best fly-fishing in the world for trophy Smallmouth Bass, Northern Pike and Largemouth Bass. Northern Minnesota and Ontario Canada is world renowned for its abundance of trophy sized fish, this area is quickly gaining a reputation as the world’s best fishery for Smallmouth Bass and Pike. In the July/August 2008 issue of American Angler Brian O’Keefe said “A fly-fishing trip into the Boundary Waters Area Wilderness gets you away from the crowds…and into the fish.” Moose Track Adventures has been in numerous publications including Fish and Fly, American Angler, Mid-West Living, Cabela’s Outfitter Journal, and Los Angeles Time, just to list a few and we welcome anyone interested in a personalized trip with one of our guides. Boundary Water Smallmouth Bass Fly Fishing Guided Trips – Are you looking to test your fishing abilities? Fly Fishing for a tenacious Smallmouth Bass will definitely do the trick. Smallmouth Bass fishing is best when the water is warm and you’re ready for frenzy on both sides of the fishing pole. Though not native to the Boundary Waters or Quetico Park, Small Mouth Bass have been described as the a treasured ‘Boundary Water Beauty’ due to their powerful fighting ability, which often leads to a deceivingly sized fish, but nonetheless, an amazing experience. These predominant and hard-hitting fish are just one of the many reasons boundary water fly fishing is the finest. Ely, Minnesota, the Boundary Waters Canoe Area Wilderness, and Quetico are home to world class Smallmouth Bass Fishing and Smallmouth Bass on a fly rod are absolutely dyn-o-mite!! When the water begins to warm you can find one of our favorite targets–Smallmouth Bass. If you haven’t fished for Smallies, you’ve got to try it! These fish fight harder pound-for-pound than any other freshwater fish. Unlike Largemouth Bass that give up after a few short bursts Smallies never quit fighting. Boundary Water Northern Pike Fly Fishing Guided Trips – Unlike the Smallmouth Bass, Northern Pike gravitate to areas near deeper, cooler water temperatures in the heat of the summer and only seek out shallows in the spring for spawning and fall for hardy meals before the lake ices over. 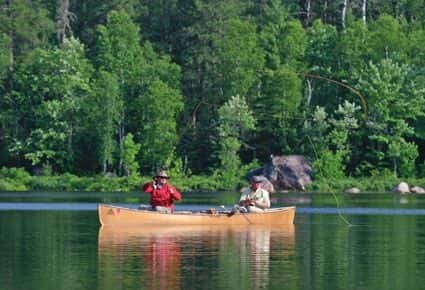 Our Boundary Waters Fly Fishing Guides can direct you to many prime spots around Ely, the Boundary Waters and Quetico, so you have the best chance of catching something ‘brag worthy’. The Boundary Waters, Ely, and Quetico receive lots of attention for its bass fishing, but many people overlook its potential as an excellent northern pike fishery. 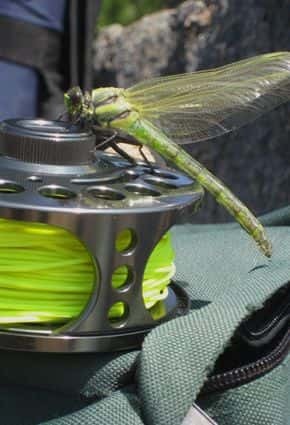 Pike up to 35-40″ are common and readily take a fly. Moose Track Adventures Guides now have specific areas that we take customers to that produce excellent fly-fishing for pike all season long. Peak times for pike are May-June and September-November. And while casting for northern pike there is always a good chance of tangling with a huge smallmouth bass. Boundary Water Wilderness Fishing at its finest! Q: What is provided on a guided day fishing trip? Q: What should you bring on a guided day fishing or canoe trip? Q: What time does your guided day trip start & where do you meet your guide? A: After reserving a trip, we will discuss with you the start time and to either meet at the resort or an Ely lake. Full or half day morning trips generally start at 6:30-7:30am. Full days are 8 hours on the water, half days are 4 hours. Q: When is the fishing opener? A: The walleye, bass and lake trout fishing season opens two weekends prior to the “observed” Memorial Day. Q: When is ice-out on the White Iron Chain of Lakes? Q: Are motors allowed on any of the area lakes? A: There are no motor restrictions on any of the lakes outside of the Boundary Waters Canoe Area Wilderness. We are located on Farm Lake, part of the White Iron Chain of Lakes – where 3 of the 4 lakes are ‘No Motor Restrictions’. South Farm Lake is in the BWCA, has a 25hp motor restriction and a Day Use BWCAW Motor Permit is required. Q: What is the suggest rod/reel/fishing tackle for the Ely Area? Lead headed jigs are by far the “best-all-around” fishing lures. And you should be equipped with lots of them. Our favorites are 1/8-1/4 oz in various colors, such as black, chartreuse, orange, pink and green.